Need literacy help? Call (530) 245-7237 or email kimberlyr@shastalibraries.org. Low literacy doesn’t mean someone can’t read “cat” and “bat” and signs documents with an “X.” In fact, an adult may successfully read text for which they have background knowledge but struggle with basic informational text about unfamiliar topics. Literacy exists on a spectrum. It’s not necessarily something one has or doesn’t, which makes it difficult to identify even for those closest to the person who struggles with it. They avoid reading. Someone who consistently waves off written text as unimportant (such as news, magazines, brochures), or chooses activity over reading may struggle with comprehension and understanding, a critical component of literacy. They have others complete forms for them, saying they are too busy or forgot their glasses. They take what they read literally, missing abstract connections and nuances of text. In other words, they see only what they see, perhaps fluently reading one word at a time but missing implied conclusions and big ideas. Be a force for positive community change. Discover how you can make a difference in someone's life by helping them improve reading, math, computer and life literacy skills. Contact our Adult Learning Center at 530-245-7237. 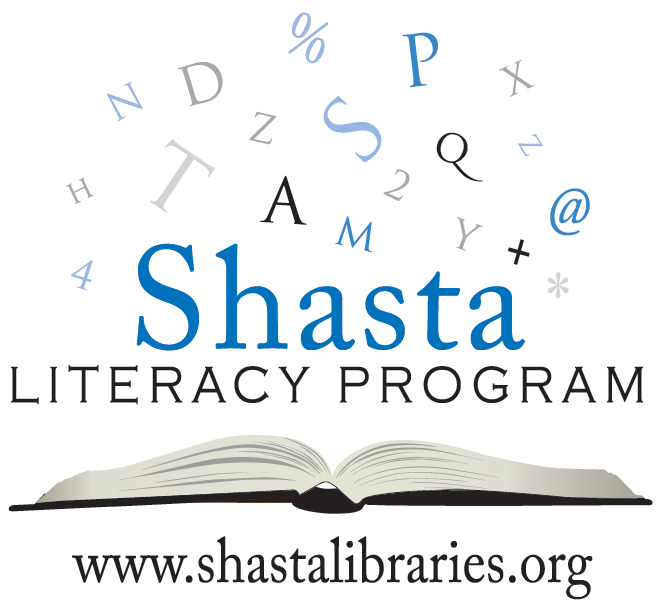 The Shasta Literacy Program is powered by many generous partners. For more information about Shasta Public Libraries’ adult learning opportunities, call 530-245-7237 or email kimberlyr@shastalibraries.org.